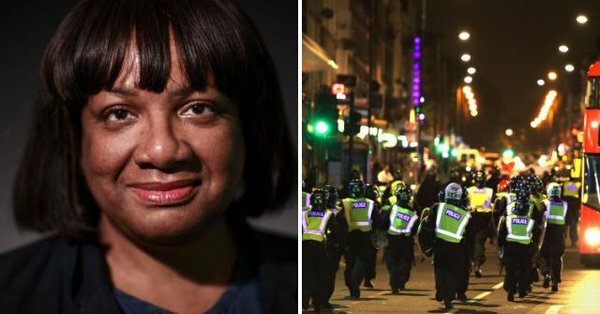 Diane Abbott pleaded for peaceful protests after the death of Rashan Charles – she certainly did NOT defend rioting. When right-wingers- especially right-wingers running newspapers – find a metaphorical dead horse to flog, they really put their back into it, don’t they? Editors of the Daily Mail, The Sun and the Daily Express took it upon themselves to misrepresent Diane Abbott after she spoke up about rioting that has taken place in London after the death of Rashan Charles, a 20-year-old man who died after being “restrained” by police. The trouble started shortly after around 150 people gathered in Dalston, near where Mr Charles was tackled by officers on July 22. Protesters threw bottles at police and barricaded Kingsland Road, a long main road which runs past the police station where the protest started peacefully and also through the area where Mr Charles died. The disorder is said to have lasted around an hour, between 10pm and 11pm on Friday (July 28). The Metropolitan Police said a 17-year-old boy was arrested on suspicion of causing grievous bodily harm, while a police officer suffered an eye injury but remained fit for duty. The Express misrepresented her with this headline: “‘It’s understandable!’ Diane Abbott defends anger as violent rioters HIJACK protest“. Of course, Ms Abbott wasn’t saying that rioting was “understandable”. She said “anger and upset” was. She was asking for protesters to respect the wishes of Mr Charles’s family – in fact advocating peaceful protest, not “hostile actions”. Perhaps these right-wing propagandists have been emboldened by the apparent success of the Tory Party lie that Jeremy Corbyn promised to write off student debts if elected into office in June. In fact, he said no such thing and there was no such promise in the Labour Party manifesto. Another recent right-wing lie is the Tory claim that parents having a job lifts children out of poverty, when in fact the rise in the number of working families simply means there has been an increase in working-household poverty. They try to pretend that valid arguments – like those presented in a recent Momentum video about the selective amnesia suffered by certain middle-class Tory voters about the help they had to become comfortably wealthy – are “hateful” attacks on bourgeois “caricatures”, but are able to mount no coherent argument against its claims. And does anybody remember the squawks of upset after This Site pointed out the political aspects of the disastrous fire that engulfed Grenfell Tower last month? Again, this had no basis in fact – the fire happened because safety regulations had been relaxed to the point where landlords could put flammable cladding on the building without being questioned over it, while neither council chiefs nor MPs reviewed safety rules. Yes, it seems I was the first to point out specifically that there was a political angle to the disaster, on the morning after it happened. The Tories and their lapdogs in the press only picked up on articles that followed in other sites, again claiming that these criticisms were inappropriate. And yet now – because of pressure from myself and the others – it’s the only story to be told about Grenfell. Perhaps the uptight right believes Ms Abbott is fair game because she has carried out a few poor performances, notably in a radio interview about police funding and personnel. It was what’s known as a “gotcha” interview – one in which politicians are criticised for failing to memorise relevant information about a policy, rather than for the policy itself. Many Conservative politicians suffered the same fate in the run-up to the general election, but did not receive nearly as much negative attention. It was later revealed that the MP has been suffering from a long-term illness – but This Writer does not recall seeing any apologies from the gutter newsrags. Really, the tone of political debate needs to be improved, and massively. Emotion-based, evidenceless claims from the right are pointless; we can all look up the facts. And personal attacks that deliberately misrepresent comments by any politician are also ridiculous, because they can use the social media – as Ms Abbott has – to dismiss these claims, almost before the printing presses have finished churning out hard copies of the lies. Shape up – or shut up. Shape up – or shut up.” It’s not a choice they will ever make willingly. These rags derserve a fine of at least £1 million plus all that days takings for papers sold, so the fine could be several million pounds. Even before I was a tenager I said that anyone who believes any news without evidence are fools, and that was over 40 years ago. Papers are like government medical asessors they take a group of words out of a very long reply, sometimes missing out crucial words, like writing Claimant states: They can walk 100 meters most days. When what they may have actually said was; On one or two days a month I might be able to walk 100 meters without pain? In any news if you want the truth go to the source if they refuse or are unavailable in might mean they are concocting a story, sometimes they are just too busy to give their account on that day, but they should never really be too busy to put the records straight. Perhap’s the right wing press would like to mention the riot control vehicles that ex mayor of london bought and cannot use at whatever cost roughly a million each after modifications, they do have a nice cd system though, however, this amount of money could have bought how many high rise fire tenders and trained crews to use them or is that to obvious and why would they need to buy three riot control vehicles expecting trouble because of there policies, you don’t need a degree in social history or to fail the maths to work that one out, time to change the law so we have responsible MP’S that are answerable to UK Law and cannot hide behind parliamentary privilege to hide there inadequacies or unfit for practice purposes. Catching up with the US. Are these tabloids regulated in anyway? Surely newspapers should not be allowed to print out lies about people or deliberately misrepresent them in this way. They are regulated. If I recall correctly, the regulatory organisation, IPSO, is chaired by Daily Mail editor Paul Dacre. Unfortunately the vast majority of their readers can’t, won’t or simply can’t be bothered. Great example of why the media is the actual and main creator of fake news for their owners political bias and creating trouble. I’m not a huge fan of Diane Abbott however quite clear where she was coming from just a pity these lame brain reporters are of such low professionalism and bias that they changed her message to create a right wing bias against her. What a bunch of disgraceful low lifes.